My MIL has so many traditional recipes in her magic hat and always surprises me with one thing or the other. I always wonder if I will have that kind of enthusiasm, patience and energy to cook complicated and very time consuming delicacies. She always makes me speechless with her delicious parade of dishes. I feel like an amateur when I compare my cooking with that of my Amma and Atte. I guess most of us will have same kind of feeling. The extra oomph comes with the love with which they cook and serve. Today is a time to share one of the very few sweets I love. (Oh yes!!! I am not a sweet person but my hubby compensates that part for me.) This delicacy is popularly known as Kashi Halwa. Ok!!! Now I need a favour from you guys. I have no idea as why it’s called as Kashi Halwa. Is it because it’s served as Prasad in Kashi or these are some other reason? All I know is its made using white pumpkin and its tastes heavenly. So here is the recipe. Remove the skin and seeds of the ash gourd and grate it. Cook it till it looses all its moisture and becomes dry. Now add sugar and again keep stirring till it becomes dry and changes its colour to golden brown. Now add ghee and keep stirring continuously till the ghee floats on top. Add cashew nuts and mix well. Remove from fire and transfer it into storage container once it cools. You can serve it hot or cold as desired. I love eating it as it is as it simply melts in your mouth. Or if you want to make it more interesting you can serve this with a dollop of vanilla or any other ice cream. I have figured out that it tastes divine with saffron ice cream. Although it’s very time consuming the end result is simply superb. the halwa looks so delicious... thanks for sharing. You are lucky to have a atte who can cook! Mine does not remove a cup from here to there let alone cooking! :D She is the queen of the jungle literally in coffee estates of Sakaleshpura! wonderful treat. wow! I love it. My mom makes something called dumroat, a halwa made with pumpkin and I love the taste of it. Not sure how it's made though. Your Kashi halwa looks really good and yum, Sup! What I liked about the recipe is that all d ingredients are easily available in our kitchen. Must try it. Thanx for sharing. 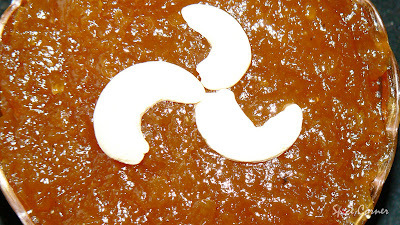 Kasi Halwa is served in all wedding functions in TN.I like to add Gulgund to Kasi Halwa it gives nice aroma and taste.Thanks for sharing this authentic recipe. thats something new to me vani. do post the recipe if u find it. thanks viji. its really a lovely looking sweet as well tastes really good. thanks archana. do let me know if u try making it:) i am sure u will love it. thanks dear:) by the way what is gulgund? never heard of it. how it looks? i am quite curious now. I have never had this Supriya...I've been missing out! Kashi halva is a nice name isn't it?? you recommend eating this with Saffron icecream...eh? I'll just have to come over and try it out then. yu, yum gal!! one of my all time fav. too. Ask you athe to parcel some. Halwa is so shiny...never had tht before...looks delicious. 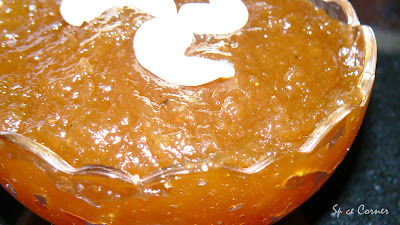 Yummy..I love this halwa the best. Is this White pumkin same as boodi kumbaLa kai? Visiting your blog for the first time. Came from"My Dhaba"after seeing your mouth watering post of idli vada sambar. The thing about idli vada sambar is that it is so easy for any south indian person but for us who are not even though we follow the recipe it does not turn out the way yours does. So could you please post some inside tips and tricks and step by step pictures of the wada batter, how you grind it , how you shape it and the final pictures? Its a great site will keep visiting. yes sri. its got that glossy look and tastes really great. yup... this is made using boodi kumbalakai. any idea as why its called kashi halwa? thanks bahi:) its my pleasure to share these traditional recipes from our region. This looks exactly the way it is supposed to and I am sure it tastes even better. Thanks for the recipe! You always come up with something new and different. I have never heard of White Pumpkin Halwa. It looks yummy and creative. A nice sweet dish from South India, right? Halwa looks so delicious.This dish is new for me.I will try for it. I visit your blog first time but your blog is great and recipes is different. welcome to my blog... just took a quick peek at ur blog and i must say u have gr8 collection of recipes.. Sorry I am too late to comment on such a mouthwatering halwa but could not stop my hands from typing. Besides I too love listening to pt.Ravi shankar and Anoushka though I dont have deep knowledge of ragas. And Supu ,which is your native? i want to visit that antique shop (jokes apart) my grandmother has some great collection of panchaloha vessels which they used to cook in. She has passed some of them on to my dad. But these days we dont get pure punchaloha stuff and they are becoming extinct.Only ppl like us who are away from our mother land know its value. phew! !spoke my heart out to someone! !hehehe...There is this site which trupti gave me called Artandcraftsofindia.com it sells some great stuff but lil expensive compared to India , they are really good though. From this site I got that painting. 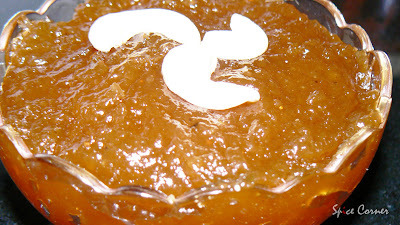 kashi is the name for the white pumpkin its called kashi fal...may be thats y they call it kashi halwa..
its called kashi halwa coz its made on the day of wedding before kaashi yaatre.